Continuity mistake: When Davy is telling Mike and Peter that Otto and Sigmund are trying to kill Bettina, the sandwich Mike has switches from his left hand to his right hand in a split second. Revealing mistake: The purple dress that Micky and Davy bring for Mrs. Weefers to wear is too big for her, showing that the dress was made specifically for Micky to wear. Continuity mistake: When the others are cheering up Mike, there is nothing on the side. But a split second after Davy has left the room, the pad phone suddenly appears on the side so that Micky can call Bernard Class disguised as 'M.D'. Trivia: When Micky (disguised as airline personnel) is talking to Davy's grandfather at the airport, the board behind him states that one of the flights is going from Los Angeles International (LAX) to Los Angeles. Trivia: When Mike is looking on the board for Hubbell Benson, other names that are on the board include James Frawley (another Monkee episode director), Richard Nunis (the director of the episode) and Jack Williams (a worker on the show). Peter: Oh no, foot prints! Someone else is on this island. Micky: Oh don't worry, those are ours, we don't have a larger set so we had to use the same one twice. Peter: Hey, look, guys! All the comforts of home. Mike: Yeah, your home, shotgun, not mine. Micky: I can't stand to see a grown bush cry. Question: When the Monkees are locked in the downstairs bedroom and they are planning to escape, where does Mick get the lab coat and the chemical bottle from which he plans to use to scare the evil people into letting them all leave? 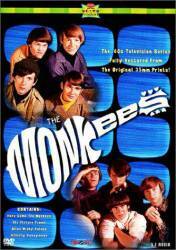 Chosen answer: The Monkees TV series was very much a fantasy (this was the "groovy" psychedelic 60s, after all). Impossible things, such as items appearing out of nowhere, happened on their show without explanation all the time.